REP. Erico Aristotle Aumentado has expressed alarm over the National Grid Corporation of the Philippines’ (NGCP) pronouncement, through Cebu and Bohol Information Officer Betty Martinez, that Bohol’s power supply is now “critical”. Aumentdo said he is also saddened with the development, because as early as the last term as governor of his namesake father and immediate congressional predecessor Erico Boyles Aumentado, the lack of power to meet the province’s need with the looming implementation and completion of the Panglao Bohol International Airport was already recognized. The solon had expected that the Provincial Government would have already foreseen this considering that it had continuously invited investors to locate in Bohol. As the investors streamed in, he said, the need for additional power, and faster internet, should have been anticipated already so that these will not reach such critical point. Investors continue to stream in, but their respective operations might be hampered due to the lack of sustainable power, or the additional cost of maintaining power generators. “To think that the airport in Panglao is not yet operating its navigational equipment for nighttime operations, the critical power situation simply means that Bohol is not yet ready for the big time,” he said. Basic infrastructure like power and communications should be in place to make investors seriously consider locating in Bohol. The slow internet has made business process outsourcing (BPO) for call centers similarly slow. The BPOs could have been tapped for more employment. Additionally, he said, President Pinoy should have fast-tracked the matching of power production with the projection, especially with the implementation and impending operationalization of the airport in Panglao. And, with the creation of the Bohol Energy Development Advisory Group (BEDAG), the Provincial Government should already have embarked into the harnessing of renewable energy like wind, tide or wave, and biomass. The province is now too dependent on coal energy. This should not be the case, as Bohol is an eco-cultural province, as first pronounced during the incumbency of then Gov. Rene Relampagos and then Vice Gov. Edgardo Chatto. Power was still comfortably available then, but a shortage now threatens. Aumentado is now pushing for the development of the Cantakoy Falls in Danao town as additional power source. JANUARY 7, 2017 will forever be etched in the minds of the over 700 households in the three-barangay island of Mahanay off Getafe and Talibon towns. This was when Rep. Erico Aristotle Aumentado (Bohol, 2nd District) powered on the ceremonial switch for the P30-million energization project for the island. Engr. Eugene Tan, manager of the Bohol II Electric Cooperative Inc. (Boheco II) assisted him. Not resting on his laurels, Aumentado recently sought updates from former Camarines Sur congressman and now Energy Undersecretary for Power, Renewable Energy, and Media Affairs Felix William “Wimpy” Fuentebella. An island will remain under-developed without the necessary basic infrastructure support. To note, in his switch-on message, Aumentado waxed sentimental as he declared the fulfillment of the promise his namesake father and immediate congressional predecessor, former Gov. Erico Boyles Aumentado, had made to the islanders. Patterned after the Leyte-Bohol Interconnection project, Mahanay taps power from mainland Bohol through submarine cables. The National Electrification Administration (NEA) through then Administrator Edita Bueno downloaded the amount to Boheco II that undertook the bidding process for the cable and installed it, along with the electric poles, power main and lateral lines. Boheco II manages the power distribution to the households as well. The elder Aumentado had broached the energization plan for the 2nd District’s 35 islands and islets to Bueno. With the technology already available, it did not take him long to convince her. However, death overtook him on Christmas Day of 2012. Aumentado, the son, picked up the pieces where his father left off. In 2015, during his own first term as congressman, he brought to Mahanay the members of the board of Boheco II to answer questions on the technical side from the islanders. “I promised them that I will give my best to bring in more hope in life by giving the light that will improve the standard of living of my constituents in the island,” he said. Now that the Mahanay islanders have finally experienced the “normal life” enjoyed and even taken for granted by mainland residents – lights at night, ice cold water and beverages, television, electric fan, and above all, refrigerators and ice to keep their fish catch fresh, he wants the other islands and islets to follow. NEA has inventoried the still powerless islands. Those not yet up for submarine-overhead cables mix or solar power like Pandanon island will be enrolled in the Small Power Utilities Group (SPUG) that will provide a generator that will run for limited periods, like four to six hours only, each night. Islanders without electricity have to sell their catch cheap. With no cold storage, refrigerators or at least ice, their fish are vulnerable to spoilage. Cooking them all in one batch is impractical. The only other option is salting and/or drying them – which cannot be done in rainy, even stormy weather. With cold storage, however, the islanders can freeze their catch, and release when they cannot go out to sea due to bad weather. This way, they can also assist in normalizing fish market prices. Consistent with the idea of shared ownership to make communities realize a better environment management and conservation, the Department of Environment and Natural Resources (DENR) launches in Bohol its awards Recognizing Individuals and Institutions towards Vibrant and Enhanced Rivers (RIVERS). The awards, formally called Rivers for Life would be given out to the best rehabilitated and most improved water quality from the country’s class 3 rivers, this June 2019 in time for the DER’s 32nd anniversary, authorities from the government’s environment agency shared. The program is basically to raise awareness on the need to protect and conserve the country’s rivers as the lifeblood of the earth and human civilization, and taking the cue from Manila Bay clean-up, tap concerted action to protect the country’s rivers from degradation and pollution and assure their suitability, sustainability and further improvement, explains Provincial Environment and Natural Resources Officer (PENRO) Charlie Fabre at the Kapihansa PIA Thursday. Aware that the government could not lend a presence enough to cover the protection and management of the entire river systems in the country, this time it looks at communities and stakeholders to help them come up with appropriate mitigation measures and interventions to help address the continued worsening conditions of river systems nationwide, the DENR official said. Earlier, the DENR PENROs and Community ENROs submitted an inventory of all rivers in their respective areas of responsibility and from these, the DENR regional committee selected class C rivers for adoption. According to the DENR, Class C rivers are those which may not be safe for swimming owing to the presence less than 100 coliform presence in the water. The goal, Fabre reiterates is to improve the water quality that flows to the ocean to at least an upgrade into Class B, which is now safe from swimming and other water activities. He reiterated that the problem with these identified rivers however are not as complex as the headwaters from which these rivers get their flow is still classified class A, which means the quality is good that people can drink from it. In Bohol, the class C rivers which have been identified for adoption and are now official entries into the regional search for the best managed rivers are Abatan which flows from its headwaters in Calape, San Isidro, Catigbian to the estuaries in Cortes-Maribojoc, Wahig, which flows from as far as Pilar, Sierra Bullones to the Inabanga water basin and in the south is Manaba River which flows from Garcia Hernandez to the seas. According to DENR’s MarcialUgay, PENRO, which has in its jurisdiction a class C river Abaran adopts the Cortes River for the RIVERS project, CENRO Tagbilaran picks Manaba River in Garcia Hernandez and CENRO Talibon adopts Wahig. The DENR offices here have initiated the activities that would bring in the possibility of these adopted rivers to be picked in the regional competitions to for the adopted body of water to flow into the national finals and be hailed best rehabilitated body of water. The activities to be implemented by the DENR and its horde of volunteers include aesthetic and water quality improvement which uses a baseline data and includes monthly water quality sampling for a year, solid waste management data of the place, partnership and community mobilization including documents on Memorandum of Agreements (MOAs), partnerships and other engagements. 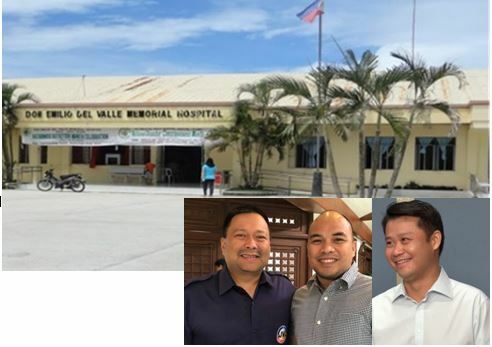 ONE more step to go, and the Rep. Erico Aristotle Aumentado’s bill upgrading the bed capacity of the Don Emilio del Valle Memorial Hospital (DEDVMH) will be transmitted for approval by the President. The Senate has approved on third and final reading the counterpart bill sponsored by Senator Sherwin Gatchalian upping the hospital’s bed capacity from 50 to 300 – with the attendant improvement of its buildings, equipment, staff. Aumentado thanks Gatchalian and Committee on Health Chair JV Ejercito for the supporting his move at the Lower House. The bill is now en route to the bicameral conference committee for consolidation and polishing prior to transmittal to the Office of the President. He said in its current state, the hospital is getting congested because patients coming not only from the 2nd District, but the 3rd District also, as well as from the island municipality of President Carlos P. Garcia and even Southern Leyte choose to be treated or confined there. Aumentado attributes this to the improved facilities and better services the hospital now offers on account of its ongoing modernization program. He said the Del Valle hospital has come a long way from its moniker “del valle-bad” (balibad is to decline) because its previously poor facilities cannot handle emergency needs like Caesarian sections or stab and gunshot wounds. Through the years, however, started by the solon’s namesake father and immediate congressional predecessor, former governor Erico Boyles Aumentado, the hospital has established dialysis units, expanded its obstetrics and gynecology department, improved its administration building and services, acquired a magnetic resonance imaging (MRI) equipment – the first government hospital hereabouts to offer this service, and is now International Standards Organization (ISO) certified. approval by Pres. Rodrigo Duterte. REP. Erico Aristotle “Aris” Aumentado has exhorted the 2nd District mayors to update their respective Comprehensive Land Use Plans (CLUPs) – ensuring that these are aligned with the District Economic Master Plan (DEMP). Aumentado said the updated CLUPs must consider the development and progress of the towns in 10 to 20 years, including the inevitable expansion of the needs for growth centers. These include markets and malls, bus terminals, seaports, airport and other infrastructure, along with the widening of the road network. The expected boom in population must also be inputted. More people will need more vehicles, more spare parts and bigger parking spaces and terminals, more farm produce, bigger markets with more products offered for sale, fast food stores, and eateries ranging from carinderias to restaurants, boarding houses and hotels, even more classrooms, bigger infirmaries or hospitals, housing projects, and power, water, and telecommunications utilities, among others. From three to four buses at a time, Aumentado said the mayors should, as early as now, think of terminals that can accommodate from 10 to 50 buses, with proper ticketing and pre-departure areas. The towns should also conduct inventories and identify their tourism potentials and the accompanying road requirements. Buildings must not be randomly constructed. Building officials must see to it that they set back construction according to road classification, otherwise, this will pose a problem when the local government unit (LGU) decides to widen the road. Aumentado said on top of paying the owners for their property now encroaching into the road right-of-way, they might ask for payment anew for the improvements. The solon said only when these infrastructure are established will a place be attractive to potential investors. More often than not, he said, investors pour money only into businesses that they are currently involved in. When they find a locale’s business climate to be suitable, they tend to expand. When they feel the business environment to be friendly, they may venture into new but related businesses. Putting up infrastructure like seaports, airports, roads and bridges, telecommunications will definitely make a place inviting to locators. He said these will facilitate the transport going in and out of the locality of goods for raw materials and finished products for marketing. Harmonizing the towns’ development plans, he said, augurs well for the synchronized and well spread development of the district.